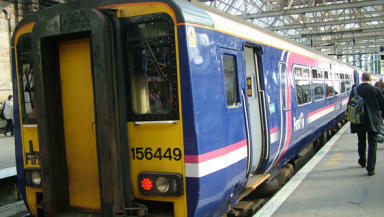 Trains are running at 50mph because of high winds, leading to reduced services and longer journey times. ScotRail can confirm that a temporary timetable will be introduced at 10.00 this morning as Network Rail applies speed restrictions of 50mph for safety reasons as a result of weather forecasts that hurricane force winds will reach 90mph. The train operator also advised commuters that because the high winds are expected to peak in the afternoon and early afternoon, it would be a sensible step to leave work earlier where practicable to help avoid rush-hour delays. Network Rail is applying the speed restriction for safety reasons, including the potential for high winds to down trees and blow other debris on liners as well as damage equipment such as overhead power lines. ScotRail stressed that there will be regular reviews of the weather warnings throughout today and contingency plans will be amended accordingly. The temporary timetable mainly involves a reduced frequency of services. ScotRail’s plans also include alternative transport arrangements as well as extra staffing resources to help deal with the worst the weather brings. All routes and services will operate normally with the exception of those listed below from 10.00 today. The temporary timetable will subject to regular review of weather warnings and services will return where weather conditions allow. Half hourly at XX15 and XX45 calling at all stations as above. Withdrawn. However buses will operate between Kilwinning and Largs where they can connect into Ayr services.